Daddy doesn't like kale very much. I do. I think it's just as good as spinach leaves that we are used to eating. I've been trying to find a way to sneak them into our diet. We all like the smoothies that I make for breakfast. It's super easy, and gets kale into our diet. I broke it down for a family of 4 and a family of 2. I first made it with orange juice, but this morning made it with water, and it was good as well. I like kale - I like it roasted. I have never had kale before, but I know a lot of people who love it. My neighbor makes a green smoothie every day. I bet she would love this recipe! I will be sure to pass it along to her! I have to say that it sounds really tastY!! I have never tried kale but your recipe looks good. I do love Kale and eat it quite a few times a week. 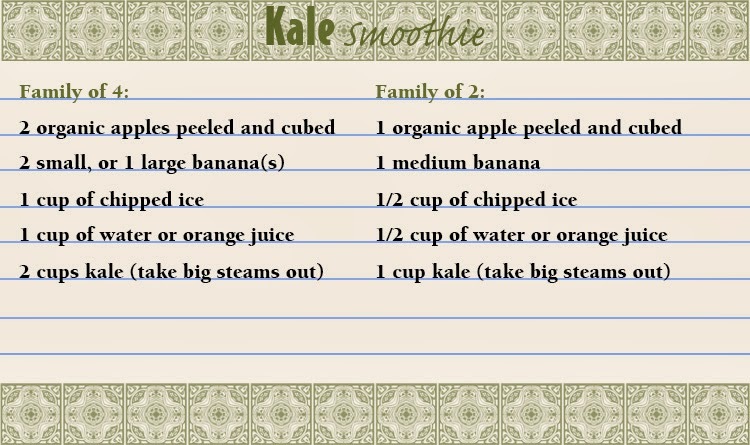 I am going to try this smoothie especially when the weather is warmer. I would enjoy it after work. I've heard Kale Chips are delicious. I haven't tried them yet though. I think I'd like the smoothie. I used to do a lot of green smoothies. Then I went on a green smoothie cleanse... that pretty much did it for me and green smoothies.